The Providence House (Kamienica pod Opatrznością) is these days part of tenement no. 13 in Kraków’s Main Market Square, but until 1847 it was a free-standing edifice. It was in the ground floor of that house, under no. 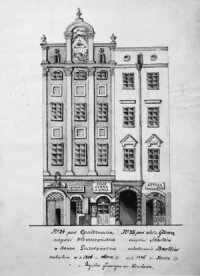 24, that the local merchant and burgher, Józef Louis, opened a store with imported fabrics in 1828. In 1863, Louis bought and renovated the whole house, and in 1846 bought the adjacent tenement, known as the House of the Golden Head (Kamienica pod Złotą Głową). 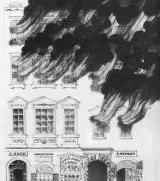 During the Revolutions of 1848, grenades caused a fire, setting wooden porches ablaze. Fortunately, a heavy downpour put out the fire, saving the house of the Louis family. 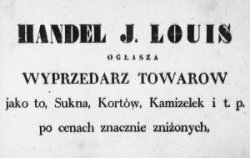 [Based on the memoirs of Józef von Wawel Louis]. After the fires, the house was rebuilt and the two tenements were merged into one building whose current address is Rynek Główny 13 in Kraków. In modern times, the place underwent a revival in the mid-1990s. After six months of renovation of the historic wine cellars, a new establishment opened to the public. 23 September 1995 saw the official opening of Klub u Louisa – the Louis Club. Since that day, patrons and proprietors have transformed this purely physical space of a Gothic basement into an area filled with the spirit of human culture, music, creativity, meetings, and community. It’s a place where, for a moment, one feels the shared passion drive for exploration before venturing out into the world once again. After a moment of reflection and respite, rather than stay put, people move on towards life, rejecting the reality of communist times, already passing into oblivion, ready and eager to welcome change. Carried by creative restlessness, they bring change through their unique and individual features. 2003 was the year of the next significant development: the Club was renovated, enlarged and equipped with air conditioning. Since the beginning of 2004, we have had the honour of co-creating this place with you, contributing to its individual character and style, unique atmosphere and the spirit of our time at the beginning of the 21st century. May this place continue its special mission of transforming 14th-century physical space into a spiritual space with its own, as it were, Louisesque vibe. While retaining its own character, may it also draw from us. As the ambience changes us, may we also change it. The Louis Club: a music club, club of travellers, club of a variety of human passions, club of social projects, live music, a gallery, an interactive venue, a pub.